I have been using mine since last November and absolutely love it. My face feels so much cleaner without any makeup or impurities left behind which I noticed ahs helped my breakouts. My original Clarisonic broke and in the two weeks I went without one I could tell my face was more congested. I can also say that their customer service is amazing! The button got stuck down and would not pop back up. I called customer service because they come with a two-year warranty on it and they happily replaced it. The lady was so wonderful, she apologized for the inconvenience, sent one within two weeks and had a prepaid box for me to send my broken one back in. 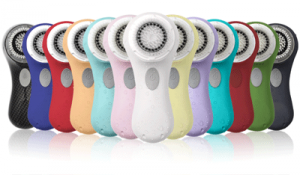 These things are pricey ranging from around $150- $200 with the replaceable brush heads running around $25 but I will honestly say it’s a great investment for your skin. One thing I think it really helps with is clearing the dead skin off that clogs your pores and also allows your products to penetrate better. Bottom Line: It’s worth the price, invest in the start of your great skincare routine.